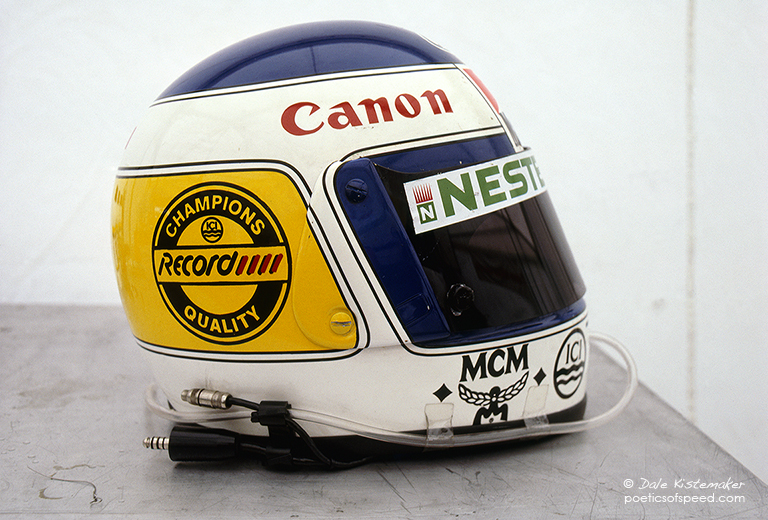 I had an opportunity to photograph Keke Rosberg’s helmet. I found a tent nearby with a steel table to use as a make-shift studio. The soft light through the tent fabric was beautiful, and I found myself staring at the helmet for many minutes. Out of context in this neutral setting the helmet became more of an anthropological art object like the helmets of a medieval knight or a samurai warrior. Instead of the colors of a king or feudal warlord the helmet was decorated with the 20th century logos of corporate sponsorship. Rosberg like all other drivers accepted this as the business of racing and personalized the design so he would be easily identified by the fans who could not see his face. I photographed it at the Dutch GP 1985.